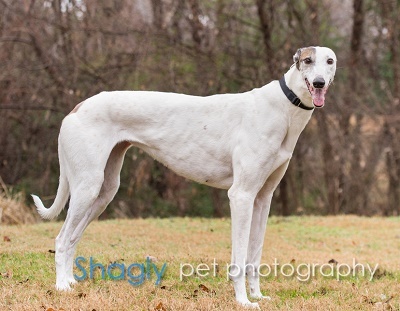 Gal, aka Kentucky Gal, is a 7-year-old white and red female born November 22, 2009. Her sire is Oshkosh Slammer and her dam is RK's Sassy Gal. 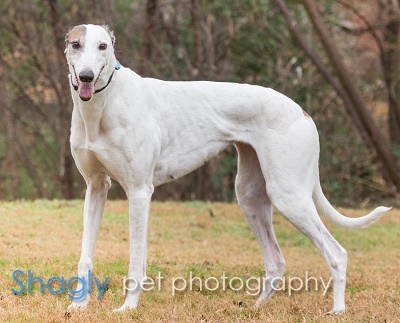 She has had quite the career, first racing in 163 races in Florida between 2011 and 2013, and then going on to whelp two litters of puppies in 2014. What a gal! She has not yet been tested with cats or other small animals. Oh what a gal this one is! Looking for a sweetheart who “goes with the flow”? This is your girl. She has been the perfect house guest and has blended into our pack seamlessly. Gal loves attention – I would call her a Velcro dog – whatever you are doing, she wants to do it with you. When she gets excited, she chatters – which is endearing. 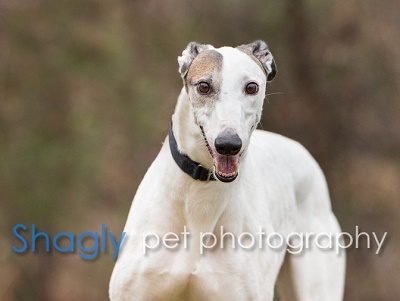 She smiles and is so good-natured she would be a great addition to any household with another hound. Please give her a look – you just might fall in love.